ATHABASKAN's lucky number seems to be three. Built at Davie Shipbuilding in Lauzon Quebec, she was the third of name, the third of her class and the third to complete the TRUMP modernization program. The ship was launched on November 27, 1970 and commissioned on November 30, 1972. Her primary weapons were anti-submarine in nature and these included mortars, homing torpedoes and two CH-125 Sea King helicopters armed with torpedoes. The Sea King is an all-weather aircraft which can operate at speeds up to 150 knots. For defence against air and surface threats, the Tribal was fitted with the Sea Sparrow missile system and a 5"54 calibre gun. Both of these systems were radar controlled. In order to combat any threat she may meet, the Tribal has been designed to operate under the most adverse conditions. She is insulated and air conditioned for the fighting efficiency and comfort of her crew. The ship can be sealed against nucleur, biological or chemical attack with the provision for recirculation of air within the ship through the air conditioning plants. On 24th August 1990, after being quickly fitted with a Phalanx mount positioned on a platform over the VDS well, ATHABASKAN accompanied by the destroyer TERRA NOVA and the supply ship PROTECTEUR, sailed for the Persian Gulf to support a multi-national naval blocade following the Iraqi invasion of Kuwait. There, as a flagship of Canada's naval Task Group, she enforced United Nations sanctions and later participated in Operation Desert Storm, the campaign to liberate Kuwait. 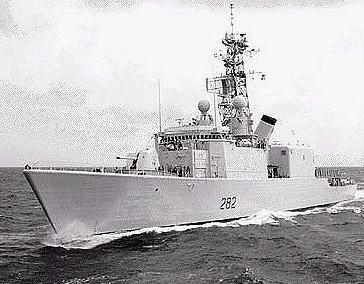 By March 1991, ATHABASKAN was on her way back to Halifax. On 6th September 1991, she set sail to Davie Shipyard , Lauzon, Quebec to commence her TRUMP conversion. When the conversion was completed, the ship now had an advanced anti-sumarine capabibility and a supportive area air defence command and control. The latter was achieved through the installation of the vertically launched surface-to air "Standard" missle system. Complementing this are the Oto Melara 76mm super rapid gun mount and the Phalanx 20mm Close-in-Weapon System (CIWS). The electronic and electrical systems in ATHABASKAN are among the most modern in the world today. A computer driven command and control center gathers data from the ship's sensors and automatically displays this information in the operations room. In order to power all this equipment and the environmental systems, the ship is capable of producing 3,250 kilowatts of power, enough to maintain a community of 32,000 people. Notwithstanding the excellence of the command and control systems, the ship's effectivness still depends upon the Officers and crew who sail her. Modern equipment and tactical development have increased rather than diminshed their role. Please refer to IROQUIS 280 for additional information regarding weaponry and performance data. Athabaskan before her TRUMP conversion. The characteristic angle of the port funnel is very apparent in this RCN photo.